Learning is available to all but only those nicotine-free for 72 hours may join! Welcome! If you've started a new quit - within the past 30 days - and have quit nicotine cold turkey (without the use of any product, medicine, procedure or e-cigarettes), and have remained nicotine-free for 72 hours then you likely qualify for membership! Before going any further, carefully read Freedom's Relapse Policy and Courtesies and Rules to make sure that Freedom is right for you. Freedom is more than a traditional Internet-based support site. It is an educational forum. None of our prior efforts failed because we picked the wrong date or because of poor planning. They ended in relapse because we put nicotine back into our bodies. We were drug addicts in the truest sense, living from fix to fix. Full acceptance of who and where we are is the first step in allowing us to see where we need to go. Freedom is a cold turkey nicotine dependency recovery group. Our relapse policy allows only one membership per lifetime. Although it sounds harsh, there must be at least one place on earth where nicotine has no voice, a place where those serious about freedom can take comfort in the fact that those supporting them are serious too. That place is Freedom from Nicotine! A nicotine-clean body is neccessary in order to apply for membership. All nicotine will be out of the body within three days of ending all use. We've selected 72 hours as the time period that applicants must remain nicotine-free in order to qualify for membership. The above education link is to articles that will aid you in navigating the first 72 hours. Both of Freedom's directors have written free PDF e-books. Joel Spitzer has provided smoking cessation and prevention services since 1972. His free book is entitled Never Take Another Puff (1.4MB). We encourage you to explore Joel's Library where you'll find more than 100 original quitting articles by Joel and his 64 video and audio quitting lessons. Also, click on the newest addition to the library, Joel's JukeBox. John R. Polito is a former 30-year heavy smoker, WhyQuit's 1999 founder and a student of Joel's since 2000. John's book is called Freedom from Nicotine - The Journey Home (2MB). If your motivation ever feels in need of a boost explore Freedom's parent site, www.WhyQuit.com! Once you meet Freedom's membership qualifications (quit nicotine cold turkey, remain nicotine-free for 72 hours, have quit within the past 30 days) and have carefully read Freedom's Relapse Policy and Courtesies and Rules you are ready for step two, applying for membership! WARNING: please do not waste your time applying for membership until you have read and agree to abide by Freedom's Relapse Policy and Courtesies and Rules as Freedom is different than any other forum and both are strictly enforced. 1. We recommend leaving this browser window open so you can read these instructions while going through the sign-up process. Open a second window, type ffn.yuku.com in the address and when the page opens click "SIGN UP" at the very top of the page. 2. Yuku's Join form will open (Join the Millions in the Yukuverse). * Select a "Username" that Freedom members will be comfortable typing and referring to when answering your messages. Please avoid names that could be controversial or reflect occupations or that could be construed as advertising. * Provide your email address. Yuku is about to send a confirmation to this email account that you will need to verify, so be sure to use the an email account you can access. * Type the first name and last name you wish to share with Yuku, and select a gender. In choosing a name, it's okay to fully protect your privacy. * Type the password you want to use and confirm it by typing it a second time in the second box to the right. Be sure to write down both your forum name and password in a place where you will always be able to find them. * Enter a birth date older than age 18. When typing the date, be sure to use the two backslash symbols between numbers and to type the entire year (all four digits), for example, type 07/25/1979. * Now for the hardest part, the Human Test. Click the box. A video will start playing. Type the words at the bottom of the video immediately following "Please enter." Type them exactly as written. After entering the words, scroll to the far right and at the bottom click "Join Yuku." 3. Yuku's Profile page will open. Ignore it for now. Yuku has just sent you a confirmation email to the email address you provided above, with the subject "Yuku account validation instructions." Open Yuku's email and click on the validation link to activate your account. Yuku registration is now complete and you should be back looking at Freedom . Although the email says that clicking on the link will allow you to post to Yuku communities, Freedom is a private community and you'll need to submit an application to us indicating that you meet Freedom's four membership requirements. 4. 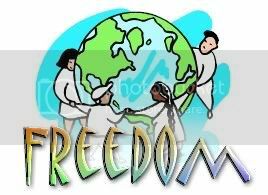 To open Freedom's application window simply open ANY Freedom message and attempt to reply by clicking "Add Reply" located at the top or bottom right hand side of the thread (string of messages). For example, click on "The Law of Addiction" - Freedom's most important lesson and then click "Add Reply" in the upper right corner. 5. You should now be looking at Freedom's "Apply for Membership" window. See the little "Your Message" box at the bottom, above and to the left of the SEND button? The most important thing to understand is that before clicking SEND that the "Your Message" box must contain each of the below four items of information highlighted in red below or you will leave Freedom's staff no choice but to reject your membership application. Again, please do not submit an application until you have read and agree, understand and agree to abide by Freedom's Relapse Policy and its Courtesies and Rules. Understanding both will make your time with us vastly more enjoyable and less taxing. Please do not apply if you do not meet the four requirements for membership. If you do qualify, click SEND after you have typed the following four items of info highlighted in red into the window/box. After clicking SEND you should see a page saying, "Your Message Was Sent" with "Where Next" links "Back to the form" and "Go Back to the community front page." Please state the above date in the MM/DD/YY format. Please note that for eligibility your quit date must be more than 72 hours AND less than 30 days. 2. I affirm that I have not used any quitting product, undergone any quitting procedure or used e-cigarettes at anytime in the 30 days prior to my above stated quitting date. Quitting products include but are not limited to: NRT (Nicotine Replacement Therapy products - the nicotine patch, nicotine gum, nicotine lozenge, spray or inhaler) Zyban or Wellbutin ( bupropion), Chantix or Champix (varenicline) or herbs. Quitting procedures include but are not limited to: acupuncture, laser therapy, hypnosis or injections. The only exceptions to the above are: (1) those who have used NRT or e-cigarettes for at least 6 months, and now realize that NRT or the e-cigarette simply transferred their delivery system for nicotine, and who are now quitting NRT or e-cigarettes cold turkey; and (2) those who were prescribed bupropion for reasons other than quitting. Please be sure to provide an email address that you regularly check. 4. I affirm that I have read and agree to fully abide by Freedom's Relapse Policy and Courtesies and Rules. Please click on each link and carefully read these two documents. 6. Congratulations! Your application has now been submitted! Freedom's staff will review it and respond via Yuku mail. Keep an eye on the little envelop at the top of the screen, and click on it to view your Yuku mail inbox messages. Your acceptance letter contains info that is not shared anywhere else on the site, including a list of sample words that are not permitted when posting. We recommend keeping a copy of your acceptance letter. Sincere thanks for your patience during the application process! What if you do not qualify for membership? If you apply for membership without providing the above information which is highlighted in red, apply before you have completed 72 hours without nicotine, or quit more than 30 days ago we will feel badly but have no choice but to deny your application. If you do not qualify for membership or feel Freedom's deadly serious focus isn't a good fit for you, we still hope you'll stay and continue reading with us. This is WhyQuit's link to other free cessation support groups. This Google "quit smoking support group" search link provides direct links to scores of additional online quitting groups. We wish you the very best. We do hope you'll continue reading, learning and growing in understanding of your nicotine dependency. We're here and remain ready to support you via e-mail. If you have questions or concerns that you cannot find answers to on the board please write us at managers@whyquit.com and we will address your questions via email.